Good news blew in from Michigan late last week: General Motors and Switch signed up as the first customers to buy wind power through Consumers Energy’s new green tariff. The new Cross Winds Energy Park II in Tuscola County will supply enough wind energy to match demand at both General Motor’s Flint Metal Center and Flint Engine Operations, as well as at Switch’s 1.8 million-square-foot data center campus in Grand Rapids. A small but growing number of utilities, including Consumers Energy, are beginning to offer green tariffs. These are utility-created programs that allow eligible customers to buy bundled energy and renewable energy credits (REC) from specific renewable energy projects. Green tariffs can be designed in many different ways, such as a subscriber program, a sleeved power purchase agreement (PPA), or a market-based rate. The end goal is the same: create opportunity for large customers to buy renewable energy, especially in regulated markets where it can be difficult to directly procure renewable energy. Well-designed green tariffs are a welcome opportunity for corporate customers who are setting ambitious targets to buy renewable energy. General Motors, in particular, shared in its blueprint “Accelerating and Scaling Corporate Renewable Energy” that it views green tariffs “as a significant part” of its renewable energy procurement strategy moving forward. Historically, these customers have chosen to sign physical or virtual PPAs with wind projects outside of their local utility. However, as we’ve seen in recent announcements from Nike, AT&T, and Nestle, companies want to buy wind energy, and the Corporate Renewable Energy Buyers’ Principles shows they want to procure it from their local grid, when they can. Renewable energy is so attractive to Fortune 500 companies because it’s now the cheapest source of new electric generating capacity in many parts of the country, and its fixed cost helps businesses plan for the long term. After all, the fuel cost of the wind and sun never changes. Consumers Energy’s Large Customer Renewable Energy tariff allows large non-residential customers, or those with at least 1 megawatt (MW) of annual maximum demand, to buy wind power directly from Consumers Energy-owned wind projects. Consumer’s tariff is currently a pilot program, with General Motors and Switch fully subscribing the level of renewable energy authorized for the pilot. As of last September, 17 green tariffs in 13 states have been proposed or approved. Thursday’s announcement was the fourth where a green tariff translated to wind energy procurement. The first came in 2016, when Facebook announced wind and solar would power 100 percent of the Los Lunas data center in New Mexico, thanks to Public Service Company of New Mexico’s Green Energy Rider. Last year, Facebook worked with Omaha Public Power District (OPPD) to design Rate261M, a green tariff that ultimately allowed Facebook to sign a 200 MW PPA with the Rattlesnake Creek wind farm, and Puget Sound Energy’s Green Direct program will be supplied by the planned Skookumchuck wind farm in Washington. Interested in learning more about the Fortune 500 companies and other non-utility customers investing in wind? 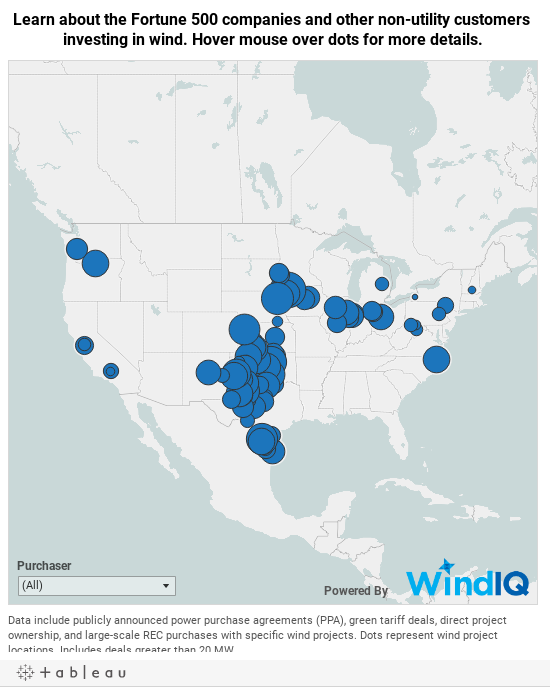 Dive into our new interactive map, which shows all publicly announced wind deals with non-utility customers at least 20 MW in size.